Begun in Australia, this new breed is a blend of Friesian and Andalusian blood. The resulting horse has the "baroque" physique of the Friesian and Andalusian, but is lighter and more compact than the Friesian, but more substantial (and hairier!) than the Andalusian. The breed is supported by The International Warlander Society and Registry, which sets requirements of breeding and conformation. The breed was begun in the early 1990s, and has gained a modest following, with breeders in Europe, Australia and the USA (particularly California). The Camarillo White Horses were developed by a man named Adolfo Camarillo in California in the 1920s, using a white stallion named Sultan, crossed with mostly Morgan mares. The white horses were used for parades and shows, and there are still a handful of them left. An association has been formed to preserve and continue the breeding and use of the white horses. The current breeding program includes select Andalusian, Morgan, Quarter Horse, Thoroughbred, Standardbred and American White Horse stock. Not every foal is born white, and not horse used in the breeding program is white - I am guessing this may be cremello or overo genetics, or even a combination of genes, although some have suggested there is a color called "dominant white" which may be active. The point is to continue the tradition of breeding of good quality, showy, white saddle horses, as begun by Mr. Camarillo. Outside horses are not permitted in the association. Read more about them here, and enjoy the lovely pictures. It is interesting that around the early 1930s a breed called the American Albino (later known as the American White Horse) was developed in Nebraska, based on a white stallion named Old King, crossed with Morgan mares. The color passes on in a similar way to the Camarillo, and the horse was of similar build originally (more Morgan-like than anything else), although more recent examples I've seen tend towards the Quarter Horse in appearance. The registry is undergoing a move at the moment, but they have a website here. 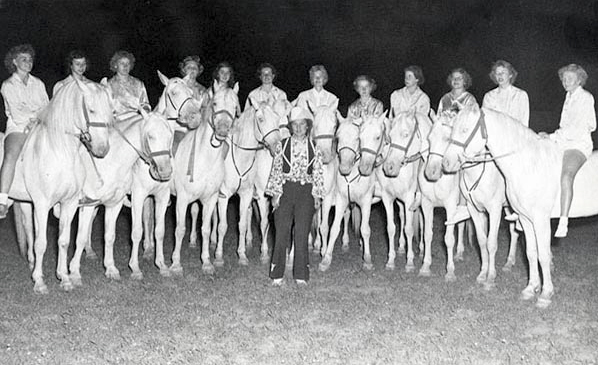 White Horse Ranch, the original breeders of the American White Horse, once had a performing troupe to support their project, but their last appearance was in 1963, and the ranch is no longer operating. Read more about the history, and some recently rescued American White Horses here. There is also a slide show of historic and current photos on that page. The Nez Perce tribe were the inventors of the original Appaloosa (see my recent post). Needless to say, the US had at times a policy of confiscating or destroying the horses of Native Americans, so only recently (well, over a decade ago now!) have the Nez Perce begun a project to rebuild their horse breeding program. With the Appaloosa now an established breed in the US, and even the Foundation Appaloosa being fairly widely bred, the program directors thought to do something unique, and began a line of crossbred horses: Akhal Teke and Appaloosa. It's an interesting mix, bringing together the light, lean energy of the Akhal Teke and the dependability and wonderful color of the Appaloosa. In the American way, the idea of this cross seems to have caught on, and other breeders are also doing this cross independently. It will be interesting to see where it goes over time. 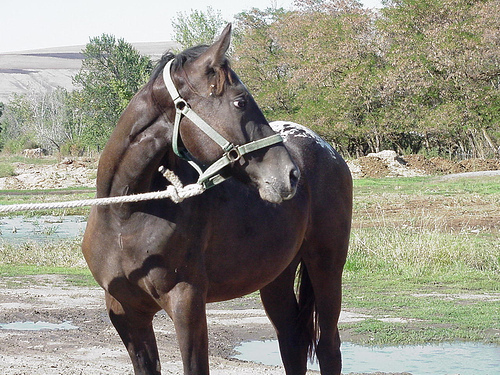 Horses take years to mature and be trained, so it is hard to determine the fate of a breed clearly until many years have passed, especially if it is not being heavily marketed.